One of the most important databases you can have is MegaBase. It has over 6.46 million games. The database is searchable by player, tournament, and annotator and you can access various keys for openings, endgames, strategic and tactical themes. Also included are annotated games and a year’s worth of weekly updates and PlayerBase (this requires ChessBase 12 or 13), which collects rating data and pictures for thousands of players if you are interested in using that feature. The 2016 version includes over 68,000 annotated games. Many of them are Super-GM games annotated by other GMs, but there are also a lot of games annotated by IMs John Donaldson and Elliot Winslow which come from come from tournaments played at the Mechanics Institute in San Francisco. One important feature is the update service that allows you access to weekly downloads of 5,000 games; this service is available for one year. Everybody knows of the enormous opening preparation that GMs and top-level correspondence players have to do. Back before computers the pros lugged around books and their own personal notebooks and index cards while correspondence players, in addition to opening books, subscribed to all the foreign magazines they could find. These days a monster database is essential. Of course, readers of this Blog aren't likely to be playing in any international tournaments and won't likely be playing any GMs soon, so why should you buy this product and what can you do with it? How do you get the most out of your database? With a databases you can review statistics on specific opening line, the percentage of the time a move has been played, how ell did it fare, when was it last played and what was its performance rating. You can locate games based on any criteria you want. 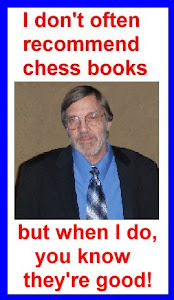 All that's interesting and can be important if you are a serious correspondence player, but most of us aren't and my experience has been that class players usually leave the book within a handful of moves anyway, so memorizing lines 20 moves deep (assuming you have the ability to do even that) is a waste of time. A good opening book that explains the reasons behind the moves is a better investment. Even if you can't remember line upon line of analysis it is very useful to be able to play over a lot of games using your opening lines so that PATTERNS become familiar and databases are great for that. One thing you do have to remember is that a database only tells you which moves been played in the past by humans and those moves may be flawed and the refutation may or may not have been found. Also, rememebr the sample size may be far too small too draw any conclusions. Another issue is when was the move last played? The older the game, the less likely the opening is to be considered good by modern standards. Case in point, in my early years Reshevsky was my favorite payers and I admired the ease in which he won games using the Exchange Variation against the Queen;s Gambit Declines and then proceeded to carry out the Minority Attack and racked up easy wins. Throw in Pachman's treatment in Modern Chess Strategy and Botvinnk writings on it, and it seemed like a great way to score points. Didn't work. Modern players were just too well versed in how to handle it, so I got a lot of draws. Also, remember that a line might score heavily, but a recent development refutes it. I once made an opening book consisting of recent games played by correspondence players rated over 2500. They players were not only highly rated, but it was almost certain that their moves were checked by engines, so what could go wrong? In one game the opening line was from a game that was 3 or 4 years old and somewhere around move 20 I noticed my engine was suggesting a major improvement that left me at a serious disadvantage. Of course my opponent played it. It is also important to consider the strength of the players in your assessment. Lines popular on lower levels may not work when played against higher rated opponents. You also need to consider whose games are in the database because games by near beginners are sometimes included. The best advice when using any database is...CHECK EVERYTHING.